Humid summer nights come alive around the porch light, a variety of flying insects swarming, some entering the house. The damp summer heralds the breeding season of the American cockroach and wood roach, which fly only to look for mates. Similar insects that look strikingly like roaches are completely unrelated species. The most common species of roach confused with other bugs is the American cockroach (Periplaneta americana). The cockroach's flat, oily body ranges from 1.5 inches to 3 inches long. The winged body is brown, with the prothorax between the head and main body a lighter tan color with a black marking that looks similar to sunglasses. The roach is commonly found in city sewers, mulch piles and other damp areas. In the southwestern United States, you may notice a large flying beetle that looks remarkably similar to the American cockroach. The Palo Verde beetle, or Derobrachus germinatus, lays eggs in the earth below paloverde trees, olive trees and rose bushes. When larvae hatch, they nibble on the trees' roots and can reach 4 to 5 inches in length during the four years they take to mature. Palo Verde beetles are longer, darker and have harder shells than cockroaches. Wood-boring beetles can be mistaken at first glance for cockroaches. Long antennae, similar body shape, six long legs and brown wings that cover the main part of the body can have you thinking these flying insects are cockroaches. Locust borer beetles can look similar to wood roaches in flight but have red, yellow and black markings apparent once they land. Ash borers are similar to size and shape of small roaches; however, roaches move faster and more erratically than beetles. The flying insect you are seeing may be a roach, but locals may refer to it by another name. In New York, the German brown cockroach (Blattella germaica) may be referred to as a Croton bug, after the Croton Reservoir constructed to supply the city’s water. 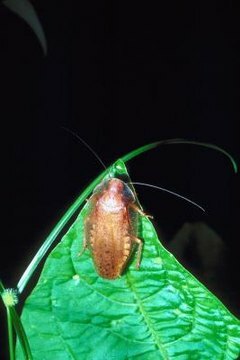 Floridians may refer to American cockroaches as palmetto bugs as they are often found in trees by the same name, and Southwesterners often refer to them by their Spanish name, "los cucarachas." Orkin: What Does a Cockroach Look Like?